Given the reccying I had done I definitely agreed with this and knew that it was going to be a challenge to complete in under 24 hours which was my goal and my schedule. I hadn’t done as much training as I did for my BGR last year and had a few annoying niggles which I hadn’t been able to shift, mainly a sore left glute and right angle which I’d twisted about 6 times during my training. I hadn’t been feeling well in myself either and considered cancelling the attempt a number of times. In the last month however I managed to get a decent block of training and avoid any more setbacks so felt confident I’d be able to give it a decent shot. 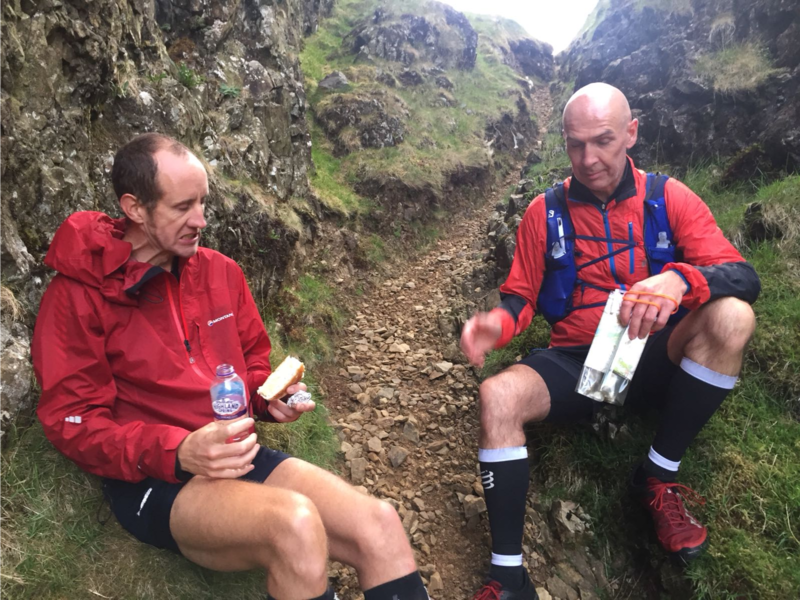 The Paddy is more relaxed than the BGR – although most people aim for sub 24 hours there is no time limit and you can start anywhere you want (the route is naturally broken down into 5 legs delimited by road crossings). I had decided to start at 11am from Capel Curig for a number of reasons. Firstly, it meant I could travel to Wales the previous day (a journey which took 8 hours because of heavy traffic and congestion) and have a relaxing morning before setting off. Secondly it meant that the section I would be doing in the dark was the Snowdon section which is one of the easier legs to navigate. The forecast wasn’t good. For the past couple of months, we’d had an unprecedented heatwave with some of the driest conditions I’ve seen on the fells but that was set to change with thunderstorms and gale force winds predicted. Unfortunately, I didn’t have the luxury of being able to pick another date so I decided to go ahead and take it as it came. During the Friday night I didn’t get that much sleep mostly because of the howling wind and rain outside the bunkhouse but when I got up around 8-30 it had stopped raining and I could see the top of Moel Siabod – the first peak which lifted my spirits. Breakfast in the village café and I was ready for the off on the first leg with Jon and Danny. The first climb is the biggest of the round but it’s not too steep and on a good path for most of the way. I made good progress and was 10 mins up by the time we reached the top. We were now however in the full force of the wind and we were getting blown sideways on the grassy descent. At one point Jon and Danny ran in front of me to try and shelter me from the worst of it. 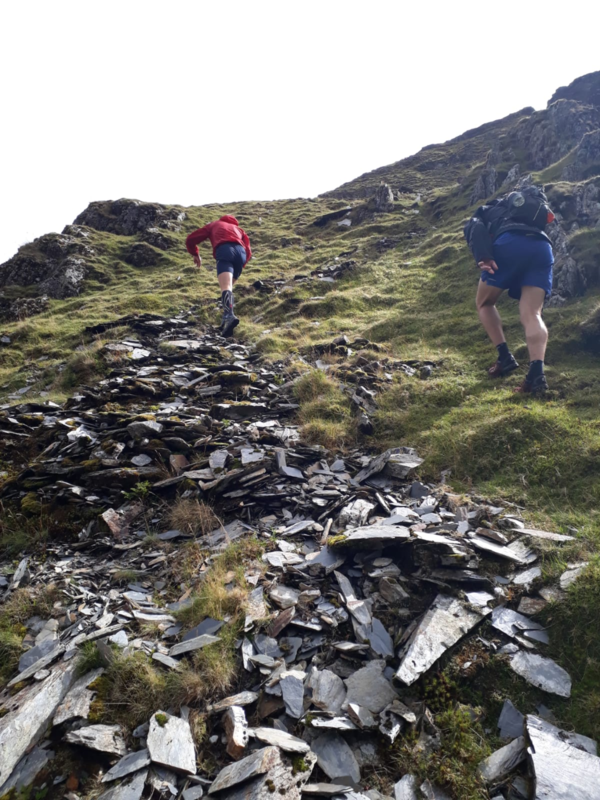 The next part of the leg is very bland – there’s not any big climbs but there’s a lot of rough undulating ground (think trudging through knee deep heather, bogs and occasional rockiness). It’s particularly miserable in mist which it had been on all of my reccies but luckily today it was clear. It also has some tricky navigation – there are a number of tops which are nothing more than rocky outcrops, some aren’t even named. We got a few lines wrong on this part but nothing drastic and by the time we reached the quarries at just over half way point in the leg I was bang on schedule after taking a quick break. 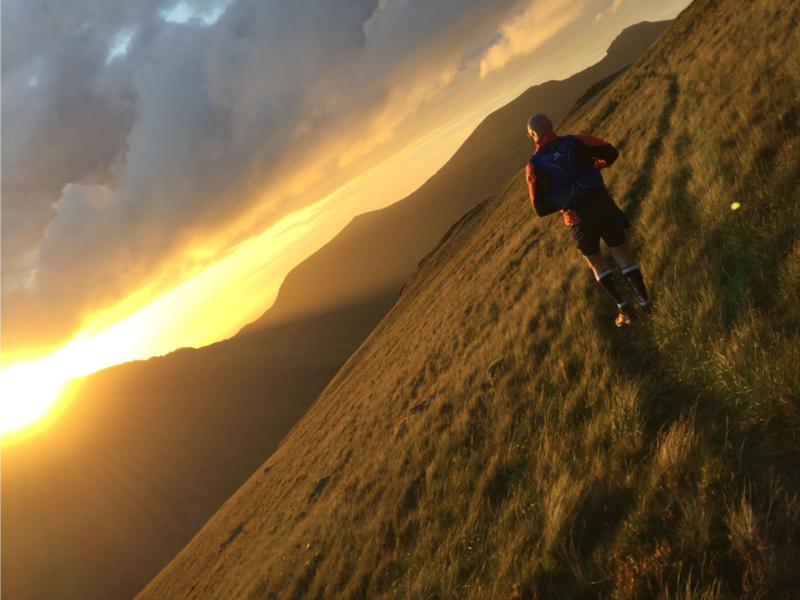 The 2nd half of the leg over the Molewyns is much more enjoyable – there’s some good running & climbing and some fantastic views. Unfortunately, the weather deteriorated at this point. The wind had never dropped but is started raining too so was hitting us horizontally & stinging my face even through my hood. When we got to the top it was like stepping into a different world. Behind us there were some evil looking black clouds and mist but in front the view opened up over towards Snowdon and the Nantille ridge which were completely clear basking in brilliant sunshine under a blue cloud free sky. This was the direction I was heading so I was encouraged and looking forward to the next section. Once the initial steep rocky descent from the top is negotiated it’s a really nice run in to the end of the leg. 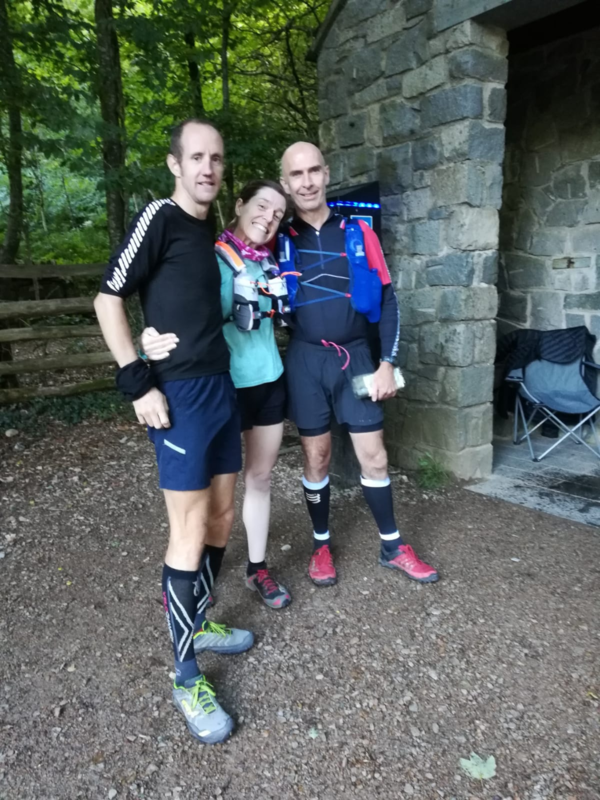 I was feeling really good and Paul & Fred joined me on the final road section to run in together to the changeover in the National Trust car park at Nantmoor. I was around 15 minutes down on schedule and I realised that making it round in under 24 hours was going to be a real challenge as I was hoping to make some time on this leg. Catherine had everything setup for me, I ate a tin of cold beans & sausages, some Lucozade and then I was ready for the next leg with Jim and Gemma. We didn’t get a very good line up the first climb on the next section up to Bryn Banog ending up in boggy ground & reeds but once we got past that made good progress up to the highest point on the leg Moel Hebog. After this I had a bit of a wobble so stopped for 5 minutes to rest and eat a cheese sandwich whilst trying to guess what pasties Paul had bought at Greggs on the way across. That sorted me out and I started to feel better again – the sun was still shining, the wind dropped and the next few miles were really enjoyable. As we climbed up Trum Y Ddysgl and the Nantille Range it started to get dark so it was headtorch time. The ridge is very narrow in places with some steep drops so we had to be careful in the dark, especially on the last part where it was very rocky and involves a fair amount of down climbing and use of your hands. 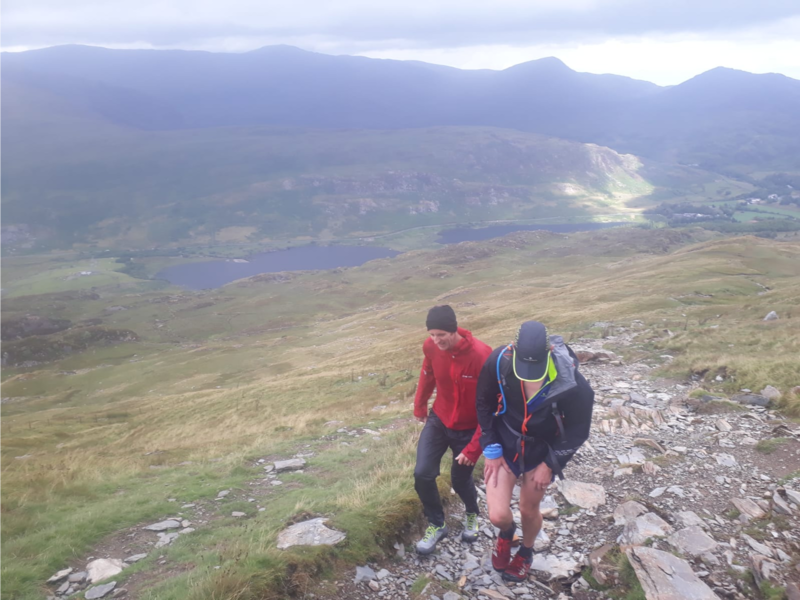 We reached Y Garn, the final peak of the leg, and then tackled the steep grassy descent and final run off through the forest to the checkpoint at Pont Cae Gors. Jim was eager to get away asap as he had agreed to run the last leg with me too (Fred was concerned about a knee injury he’d picked up and unfortunately Francis who was also down to run the leg had to pull out). I shovelled down a big bowl of pasta and then it was time for the off with Iain on the next leg. I had only reccied the first half of the next section once and never in the dark but I wasn’t too concerned as you can follow a wall for much of the way and apart from the first climb which is on open fell there are some good paths. The first few hours went without incident apart from Iain falling off a wall and losing my compass (luckily Iain had brought one too). As we started the big climb up Snowdon it started to rain but it was pretty light and calm and I was warm enough so I didn’t put on any more layers or my waterproof trousers – a decision I’d later regret. As we got closer to the top the rain became heavier, the clag closed in and the wind also significantly increased. It was quite a battle to stay on my feet to touch the summit cairn, especially given how greasy the rocks and paths were. From the top of Snowdon we traversed round to the outlier of Crib-y-Ddysgl. Ian wanted me to lead the way as he hadn’t reccied that part but I was finding it difficult to see the ground in front of me as Iains head torch was casting my shadow in front of me and obscuring my view. I realised the batteries were fading in my headtorch and it was at this point I started to get really cold. I knew that I needed to put on more layers and change the batteries in my headtorch but I really didn’t want to stop – I knew that as soon as I did that I would get cold very quickly and there was no shelter anywhere. I had already taken a bearing and we traversed down over the Llanberis path & railway line & picked up the Ranger path. I’ve been down this path a good few times before – it’s normally good running and I thought I’d be able to generate enough body heat to keep going, lose some height and then stop when we had got a bit further down in some shelter. Unfortunately, a well trodden path that is easy to follow in good daylight conditions is not so easy to follow in darkness and mist when visibility is down to a few feet. My headtorch was barely casting enough light for me to see the path in from so I wasn’t making as fast progress as I’d liked, especially as the wind was doing its best job to blow us back up the mountain. The path led onto a rocky plateau and we lost it, ending up on a rocky patch ground which reduced our progress to a stumbling walk. It was at this point I couldn’t delay any longer – I had to stop and sort myself out before I became hypothermic. I told Iain to give me my waterproof trousers, thermal buff, fleece and thick gloves and asked him to try and change the batteries in my headtorch. It was quite a battle getting everything on in the driving wind and rain and my dry clothes ended up getting wet in the process. I was fairly certain the path was too our left but I didn’t want to take the chance to bearing that way to try and find it in case I was wrong and ended up going further off route. I had my phone with OS mapping software on which I was carrying as a backup and I got it out to see if I could pinpoint our location. Unfortunately, my hands were so wet and cold I couldn’t even unlock the screen and Iain couldn’t either. A timely reminder that whilst technology can be a useful aid in the fells it should never be solely relied on and there is no substitute for a map,compass and good mountain skills. At this point I was shaking quite badly with the cold and I think I was scaring Iain who was still trying to change the batteries on my headtorch. I told him to just leave it as I knew I had to get moving again – he tried to put it back on my head but unfortunately it snapped in the process. It was quite a scary few minutes but I had to keep telling myself to keep calm and not panic. I was freezing cold and we had lost the path but I wasn’t injured and moving ok and I knew we were not far off where we needed to be. I carried the headtorch it in my hand and instead of trying to find the path we just pressed on the bearing we had been following. 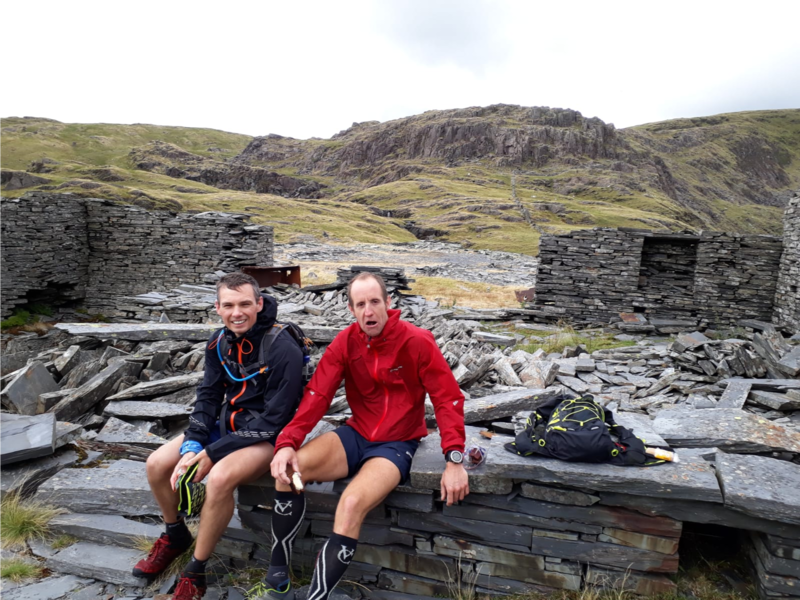 Iain started talking about escape routes back to Llanberis – in all the drama I hadn’t considered the possibility that I wouldn’t complete the round. We managed to get back on the path again and after losing a fair bit of height we found a sheltered spot behind some rocks. My headtorch hadn’t actually snapped, just came out of its casing so I was able to repair it and finally change the batteries. It was whilst sitting there that it finally sank in that I wasn’t going to get round. To be honest it was an easy decision to make and I made it fast. Although I had stopped shaking I was far from warm. The conditions were getting worse and I still had the most technical end exposed sections of the round to come, and still a fair amount of climbing to do on this leg. In any case there was absolutely no chance Iain was going to let me continue – the only decision left to be made was how to get off the mountain. Iain wanted to take a direct route & follow a gulley and a stream which led back to Llanberis. I didn’t like this option as I’d not been down that way before & didn’t know what the terrain was like – it could be really rough and slow going. He also suggested sticking to the Ranger path all the way to the Snowdon Ranger YHA. I didn’t like this option either as it meant we were miles away from the car & not guaranteed to get a phone signal or be able to get into the hostel. The route I wanted to take was to follow the Ranger path down a bit further but then join another path which involves a little climbing but leads directly back to Llanberis. I’ve been that way before & knew that although it was longer than the other choices it was a well defined path and I’d be able to make steady progress once we were on it. I could see Iain’s logic – he was worried about me and wanted to get down as quickly as possible and he was concerned about my decision making ability – it’s one of the things that is compromised by exhaustion and hypothermia. Although I was still cold my head was clear and we agreed to take my choice of route. We got back Llanberis without any further incident and Paul & Catherine sorted me out & we drove back to Capel. When you haven’t succeeded in a challenge its natural to look back and reflect on what went wrong, question your decisions and ask whether you could have succeeded given a different turn of events. Could I have completed the round if I’d kept on going? I think I would have probably had a decent chance given the fact I was still feeling ok physically and assuming I’d be able to warm up enough in the car in Llanberis and also given how stubborn and determined I can be. Would I have enjoyed it? Given the conditions probably not very much. Would it have been safe to do so? I still had the most technical and dangerous section of the round over the Glyders and Tryfan to go in atrocious conditions so no it wouldn’t have been safe. Is there anything I could have done differently? I should have layered up earlier on Snowdon before the weather turned really bad – easy to see in retrospect but I’ve been in similar situations many times before – if I was going to be on a ridge for a while I would have layered up but once the summit has been bagged it’s normally a fast descent where you can lose height and warm up quickly. Unfortunately, the fading batteries in my head torch impeded my progress so that didn’t turn out to be the case – I should have changed the batteries at the start of the leg. Maybe however it would have just been delaying the inevitable. It continued to rain heavily all day Sunday and the conditions didn’t get any better. So in retrospect I’m comfortable with my decision and it’s pointless having any regrets – there’s nothing I can do about it now. It gives me an excuse to spend more time training in Wales for another attempt next year and also fits in well with my training for the Dragons Back. I’d done 46 miles & 20,000ft of ascent so not a bad days graft and it’s given me confidence that barring circumstances out of my control I’ll be able to make a successful attempt. I’d like to thank everyone who was part of the day and helped me, especially Iain for looking out for me during a scary time and Catherine for waiting around in the dark and wind/rain for hours and having everything I needed ready for me. Also apologies to Paul and Fred for coming all that way and not get a run in, although I’m sure deep down they were a little relieved they didn’t have to go out in those conditions.